Folk Art Stitchery Quilts - We're Tops in Quilts! Suddenly everyone wants a quilt with a modern design or print. Are you also tempted to buy one? Do you know that these modern prints can be easily created at home too? If you are all game to stitch a modern design onto a quilt using some very simple techniques, read on and set to work immediately. Have you seen modern art or paintings? There is no specific pattern for a color or no commonly seen color combinations there. Use the same technique in your quilt. Check out magazines or pinterest for more ideas on how to mix and match colors. Make use of solid fabrics to decorate your quilt. Make definite patches with solid colors that stand out. 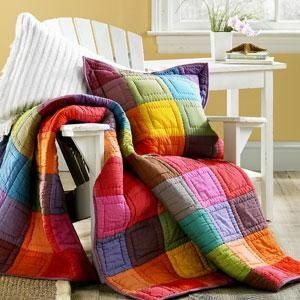 This will make your quilt get a neutral look which is the trend nowadays. It is a good idea to leave blank spaces in between the solid fabrics. This will attract people who look at the quilt. You can also create specific patterns with the solids or choose any two colors with a repetitive pattern. There is no need to follow a specific block size .This depends on your choice actually. You can either go for the same block sizes all over or you can choose a large block and incorporate designs within. Again you can randomly choose various block sizes to give a completely dazed look. When combined with extraordinary color combinations, you have a most modern looking quilt ready. Have you noticed how collages of photographs and pictures are popping all over the place? What better ideas can you incorporate in your quilt? Choose as many fabric pieces you get, they can be any color and size. Sew them on randomly. If you are particular about a specific pattern you can follow that or you can create imperfect collages of all these tiny pieces. All together they will look creative and crafty. When you are a beginner in quilt making, you may find it a bit difficult to start out with complicated patterns. There are some easy tips with which you can practice and familiarize yourself with the fundamentals of quilting. 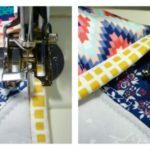 As you start working on a quilt, especially when you are a beginner, you have to go for large designs or large pieces of fabrics which require fewer efforts in sewing. Going for large patterns will ensure fewer errors too. You can practice easily with these large patterns and become an expert. Squares and rectangles are the easiest patterns to sew. You will find it hard if you choose other patterns. Triangles are also hard to work on if you are a beginner. So it is better to practice with easier blocks. You can try out various sized squares and rectangles. There are practice kits available too which will help to get more practice. Get hold of some pre cut fabrics and try out designing the quilt. These packs will have designs and instructions as to how you can sew them onto the quilt. Follow the instructions given on the pack carefully. Read through these instructions and get a good idea of how to proceed. It is always a good idea to attend a class before you start working on a quilt. You will be able to understand the basics when you learn from with the help of an experienced person. This will give you practical knowledge too. Once you start with assistance, you will be able to clear doubts as and when they occur. There are many online courses also which offer guidance. This is handy for those of you who do not have the extra time to rush to a class. Do not get discouraged if your first attempt doesn’t turn out to be as you imagined it. Like every other art form, this also requires patience and practice. Most quilt fabrics are 40 by 44 inches wide. This means that when you try to make the back piecing for a quilt, several pieces may have to be joined together. It is quite difficult to get a single piece backing for an entire quilt, especially large ones. Look at a few tips to piecing quilt backing perfectly. Make the quilt backing larger by 4 inches on all sides. This will help to adjust any shortage at a later stage. Always use a backing calculator to determine the length and width of the batting material which will be needed. Try getting the fabric in one piece from wholesale retailers. You need to check the grain line of the fabric and join pieces to match this. So a crosswise grain will have to be matched to the crosswise grain of another fabric and not to the lengthwise grain. It is the same for lengthwise matching too. Make sure that the pattern on the pieces of the fabric being joined match each other. If circles are included in the pattern, joining them abruptly will look awkward. In such cases, you may need to cut off an entire row and join the fabric to make it look continuous. Such small tips will surely help you to get a piece backing which looks perfect for your quilt.